Patrick Amuriat takes oath as FDC president. Looking on is his wife. Photo by Mary Kisakye. Newly elected Forum for Democratic Change president Eng. 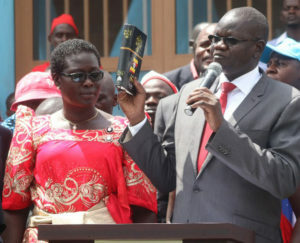 Patrick Amuriat Oboi has said that reviving the defiance campaign is high on his agenda as well as reclaiming the 2016 FDC presidential election victory. Speaking at his swearing in ceremony at the party headquarters in Najjanankumbi on Friday, Amuriat who is a close confidant to Dr.Besigye, said many things are not moving on well in the ruling government, adding that in order to bring them to order, it is only the defiance campaign that needs to be applied. “We will live to our campaign slogan of leadership with action. We cannot continue massaging the dictator but bath him with fire,”Amuriat told party officials and supporters on Friday. The defiance campaign was started by opposition houncho Dr. Kizza Besigye a few months to the February 2016 presidential polls in which he rallied the members of the public “take back their power” from the few who he said wield it with the help of “guns”. Through the campaign, he rallied the masses against government by defying directives and orders by agencies like police all aimed at regime change. Addressing party supporters on Friday, Amuriat decried the high levels of unemployment in the country that have forced many to run to Arab countries to look for odd jobs. These, he said, can all be done away with through the defiance campaign. The new FDC president cited the recent industrial action by medical workers, prosecutors and judges as good examples of the defiance campaign that he said would lead to change of government. He said that they would begin with the stalled local council elections adding that they need to force the Electoral Commission to organise them and that they would participate in the elections. “Because of the Togikwatako campaign, the NRM stopped the LC one elections because they realised they would lose all seats. We shall ask the Electoral Commission to have the elections held soon and we shall participate,”Amuriat said. Four time presidential candidate, Besigye, rejected the 2016 poll results after they indicated that he had been defeated by President Museveni. Besigye would later swear himself in before being arrested and detained in Moroto and charged with treason. Amuriat said they would resume their demand for an audit into the polls as part of the campaign to reclaim their ‘stolen victory’. Amuriat, a former Member of Parliament for Kumi County, defeated Maj. Gen Mugisha Muntu who had served as president for five years, a win many analysts saw as a triumph of the ideas of defiance championed by Dr.Kizza Besigye.